The Maine Shared CHNA began as the OneMaine Health Collaborative in 2007 as a partnership between Northern Light Health (formerly Eastern Maine Health Care System, EMHS), MGH, and MH. After conversations with the Statewide Coordinating Council for Public Health, the Maine CDC joined in 2012. The effort was named the Maine Shared Health Needs Assessment and Planning Process or SHNAPP. Central Maine Healthcare (CMMC) joined the group in 2013. 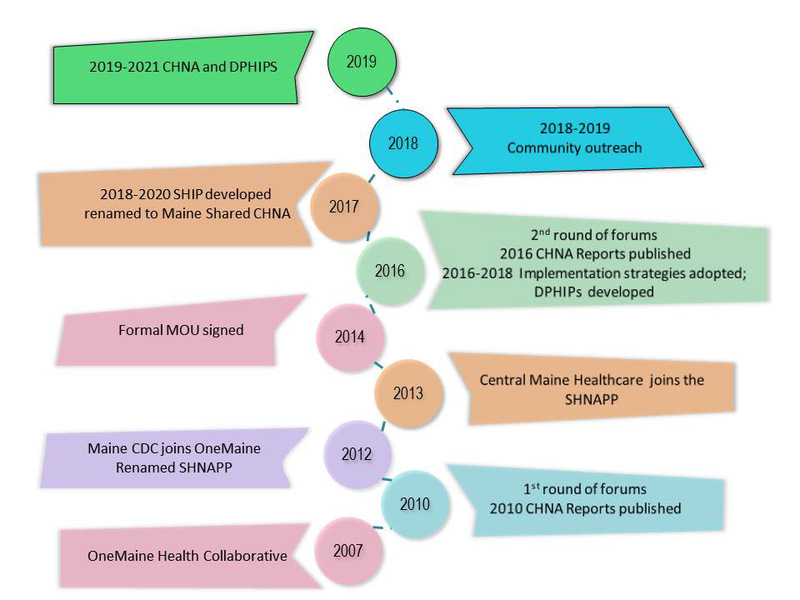 In 2014, CMMC, Northern Light Health, MGH, MH and the Maine CDC signed formal Memorandum of Understanding and drafted the Maine Shared CHNA Charter (PDF) to guide the collaborative. In 2017, the name was changed to the Maine Shared Community Health Needs Assessment or Maine Shared CHNA. The Maine Shared Community Health Needs Assessment (CHNA) is intended to coordinate State and County needs assessments. This effort the CHNA needs of hospitals; supports state and local public health accreditation efforts; and provides valuable population health assessment data for a wide variety of organizations across Maine. By doing this together, we avoid duplication of efforts and foster collaborative partnerships. The CHNA reports provide up-to-date health information at the state, county, urban, and sub-population levels. Central Maine Healthcare is an integrated healthcare delivery system serving 400,000 people living in central, western, and mid-coast Maine. CMH's hospital facilities include Central Maine Medical Center in Lewiston, Bridgton Hospital, and Rumford Hospital. CMH also supports Central Maine Medical Group, a primary and specialty care practice organization with a presence in 17 Maine communities. Other system services include the Central Maine Heart and Vascular Institute, a regional trauma program, LifeFlight of Maine's southern Maine base, the Central Maine Comprehensive Cancer Center, and other high quality clinical services. Northern Light Health is an integrated health care system with sites of care spanning from Aroostook to Cumberland counties. Northern Light Health partners with individuals and communities to improve health and well-being by providing high quality, cost effective services. Northern Light Health members include nine hospitals: Northern Light Eastern Maine Medical Center, Northern Light Mercy Hospital, Northern Light Acadia Hospital, Northern Light AR Gould Hospital, Northern Light Inland Hospital, Northern Light Sebasticook Valley Hospital, Northern Light CA Dean Hospital, Northern Light Maine Coast Hospital and Northern Light Blue Hill Hospital. Affiliated hospitals include Mayo Regional, Millinocket Regional, Downeast Community and Houlton Regional hospitals. Northern Light Health clinical services also include Northern Light Beacon Health, a statewide ACO and Northern Light Home Care and Hospice, nine nursing care sites, retail pharmacies, air and ground emergency medical transportation services. MaineGeneral Health is an integrated, not-for-profit health care system which provides a wide range of services throughout central Maine's Kennebec Valley. In November 2013, MaineGeneral opened a 192-bed; state-of-the-art hospital in Augusta named the Alfond Center for Health. Renovations to transform its Waterville Campus named the Thayer Center for Health were completed October 2014. The health care system includes a regional cancer center; primary care and specialty physician practices; long term care facilities; rehabilitation; home health care and hospice services; specialized care for people with memory loss; community outreach programs and retirement living options. MaineHealth is northern New England's largest not-for-profit integrated health system, with more than 18,000 employees across 11 acute care hospitals, physician practices, post-acute and behavioral health providers, and labs in 12 counties in Maine and eastern New Hampshire who are dedicated to a vision of working together so our communities are the healthiest in America. MaineHealth member organizations include Maine Medical Center, Coastal Healthcare Alliance (Pen Bay Medical Center and Waldo County General Hospital), Franklin Community Health Network, LincolnHealth, Maine Behavioral Healthcare, Memorial Hospital, Southern Maine Health Care, Western Maine Health, MaineHealth Care at Home, and NorDx; the MaineHealth Accountable Care Organization is also part of the MaineHealth family. Affiliates of MaineHealth include MaineGeneral Health, Mid Coast-Parkview Health, New England Rehabilitation Hospital of Portland and St. Mary's Health System. Maine Center for Disease Control and Prevention is an office of the Maine Department of Health and Human Services, whose mission is to preserve, promote, and protect the health of Maine people. Maine CDC is accredited by the Public Health Accreditation Board (PHAB). Maine CDC is responsible for participating in or conducting a State Health Assessment, which is fulfilled by the Maine Shared CHNA. Maine CDC is also responsible for collaborating with public health partners to create and implement a State Health Improvement Plan, which will be informed by the Maine Shared CHNA. The Maine CDC is providing significant data analyses in-kind for this project and work contracted for in this RFP will need to be coordinated with their work. The Steering Committee is made up representatives from these five entities and provides leadership for the creation of an efficient, integrated, and sustainable process to conduct triennial CHNAs and subsequent public health improvement plans and hospital implementation strategies. In addition, this group provides stewardship of the resources made available through financial contributions from CMHC, Northern Light Health, MG, MH, and substantial in-kind contributions from the Maine CDC. This core group guides every aspect of the project. This committee communicates with CEOs and respective leadership from their organizations in fulfillment of the MOU signed in 2014. Additionally, this group oversees the work of the Maine Shared CHNA Program Manager. Two committees report to the Steering Committee: the Metrics and the Community Engagement Committees. The Metrics Committee is charged with updating the common set of health indicators; developing the preliminary data analysis plan (to identify scope of work for Maine CDC and Maine Shared CHNA vendor); reviewing best practices and research to ensure that indicators on emerging health issues are identified as needed; making recommendations for annual data-related activities and estimating projected costs associated with these recommendations. Members of the Metrics Committee share their expertise with the group to create processes and deliverables for the Steering Committee to review and approve. Members of the Metrics Committee include representatives of the Steering Committee, public health system partners, Federally Qualified Health Centers, academia, non-profits and others with experience in epidemiology. The Community Engagement Committee is charged with making recommendations for approval by the Steering Committee outlining a consistent and robust community engagement process. This process should outline a method of: disseminating Shared CHNA state and county-level results; identifying priorities among significant health issues; and identifying local, regional, or statewide assets and resources that may potentially address the significant health needs identified. The Community Engagement process should also yield valuable qualitative data. Members of the Community Engagement Committee share their expertise with the group to create processes and deliverables for the Steering Committee to review and approve. Members of the Community Engagement committee include representatives of the Steering Committee, public health system partners, Federally Qualified Health Centers, academia, and Maine non-profits such as United Ways, Community Action Programs, and others with an interest in broad community representation and input. In addition to the state-level Community Engagement committee, local community engagement committees are formed to guide the logistics of community forums and events within each District. In some cases, County-level committees within public health districts have formed to do this work. If you wish to join the effort or ensure you are kept informed of our progress please contact a Local Community Engagement Planning Committee near you. The Data Analysis Workgroup took the set of indicators and the data analysis plan as laid out by the Metrics Committee and collected and analyzed the data. Members of the Data Analysis Team shared their years of epidemiological and data analysis experience and knowledge of best practices to inform all aspects of the final health profiles at the county, public health district, urban, and state level. This included not only the data analysis but recommendations on best practices for data presentation and visualization.